The depths to which “respected” journalists will stoop in seeking to create a narrative to sway elections and poll numbers defy comprehension. False allegations, slanderous innuendo and general hit-job reporting, which were once relegated to angry bloggers and unhinged writers, have been steadily creeping into what many regard as respectable news organizations. If the AP was so hell bent on linking the Ku Klux Klan to the presidential race, it would have been closer to the truth to claim that Clinton’s support for a wall and her past unretracted support of profiling might be a sign that things are going the way of the Klan. The history of the Ku Klux Klan and its inherent racism are inexorably linked to the Democratic Party. Apologists ferociously distance themselves from that fact, claiming the Democratic Party of today is nothing like the party of the second half of the 19th century. The truth, however, is that Democrats supported Klan-backed oppression and violence against blacks and Republicans for more than 100 years. It takes only a handful of examples over time to illustrate this ugly track record. When the 14th Amendment to the Constitution was being debated in Congress in 1866, not one Democrat in the House or Senate voted for it. Not satisfied with opposing Republicans on congressional votes, the KKK murdered no fewer than a dozen South Carolina Republican state legislators in 1870. By the 1924 presidential election, the Klan was so institutionalized within the Democratic Party it rallied enough convention delegates todefeat a party platform plank denouncing the Klan. 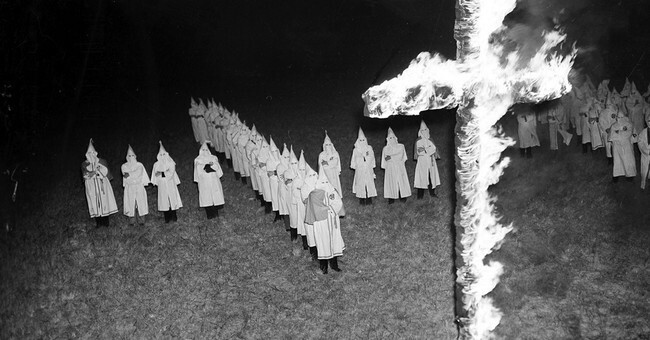 Klansmen were so pleased with the results they conducted a notorious celebration that came to be known at The Klanbake. President Franklin D. Roosevelt, who Bill Clinton said was the greatest president of the century, thought it best that we enter World War II with a segregated military despite calls from the GOP to integrate the armed services. While FDR didn’t have time for an executive order integrating the military, he did find time to order the internment of more than 100,000 Americans who had the bad luck of being born of Japanese ancestry. Democrat antics accelerated during the civil rights era with Governors George Wallace and Orval Faubus refusing to integrate schools. In Washington, DC, former Klansman and U.S. Senator Robert Byrd was busy filibustering the 1964 Civil Rights Act. This is a smattering of the hundreds - probably thousands - of ways in which Democrat Klansmen, with the support of their party, spent more than a century terrorizing and oppressing black Americans. The intimidation of the past continues today; just ask any African-American who has been viciously attacked as an Uncle Tom or an Oreo simply for disagreeing with liberal orthodoxy. Yet the Associated Press, in publishing its KKK retrospective, stomps and spits upon the values of which they purport to hold so dear as they go out of their way to taint the Republican Party and the Trump campaign. Small wonder that GOP presidential candidates hover in the high single digits when it comes to winning the black vote. Between the lies of Democrats running for office and a supposedly unbiased media ready to promote such fallacies, it’s a wonder Republicans receive even that many African-American votes. Donald Trump has an opportunity in 2016 to shift this dynamic. It won’t be easy but then again, we weren’t supposed to be even talking about Trump at this stage of the electoral process. Anything is possible in this election cycle—save an accurate detailing of racism in the Democrat Party.